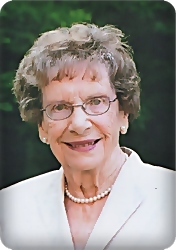 Anita Jeanette Harrington, age 98, of Wyoming, entered her heavenly home on Thursday, January 17, 2019. Anita was born in Elk River, MN. She spent most of her life in Detroit and graduated from Pershing High School. Her retirement years were spent in Pinellas Park, FL, before moving to Wyoming, MI. She loved being with her family and enjoyed reading and traveling. She was very involved in Cub Scouts, Brownies, Girl Scouts, and was a Troop leader for all her girls. Her son, Scott, preceded her in death. Anita will be lovingly remembered by her husband of 77 years, Roy A.; her children, Gary (Patty) Harrington, Nancy (Don) Viles, Diane (Mike) Sabbe, Debbie (Jim) Conner; daughter-in-law, Laura Harrington; grandchildren, Kristin (Craig) Coughlin, Jennifer Griffith, Robert Viles, Lisa (Terry) Spencer, Pamela (Edward) Fetz, Julie (Kevin) Garcia, Allison (Brad) Ritter Laura Conner, Michelle Conner; 16 great grandchildren; four great-great grandchildren; many nieces and nephews. A memorial service will be held at 11:00 am on Monday, January 21, at Carlisle United Methodist Church, 1084 76th St. SW, with Pastor Gary Zinger officiating. There will be an hour visitation prior to the service. Interment will be in Ft. Custer National Cemetery. Memorial contributions may be made to Faith Hospice, 2100 Raybrook St. SE, Ste. 300, Grand Rapids, MI 49546-5783. My thoughts and prayers are with you Gary and Patty and your family. I know you have wonderful memories.